Specialist in electric underfloor heating. Great value heating systems with free next day delivery throughout the UK. Choice of premium quality programmable thermostats are supplied as standard with all of our electric underfloor heating systems. 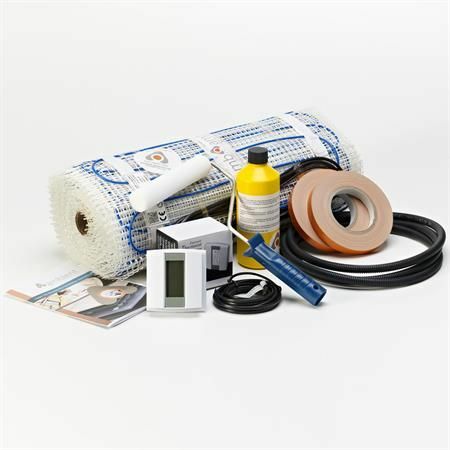 Ambient supply a vast range of electric underfloor heating mat systems and electric underfloor heating cable kits to suit all floor types. 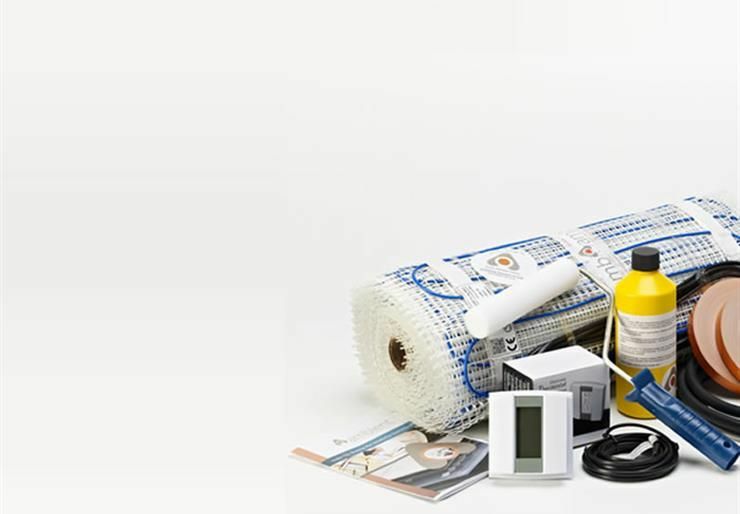 Ambient Electrical is a specialist Electric Underfloor Heating company, we offer a comprehensive range of tried and tested floor heating products for delivery throughout the UK on a next working day basis. We are proud of our reputation for exceptional customer service, both before and after-sales, and offer the widest UK range of quality electric underfloor heating systems at genuine value for money prices. Checkout our independent customer reviews and contact Ambient Electrical on 0800 783 5366 or email us at info@ambient-elec.co.uk to get your project started. and under laminate foil heaters. 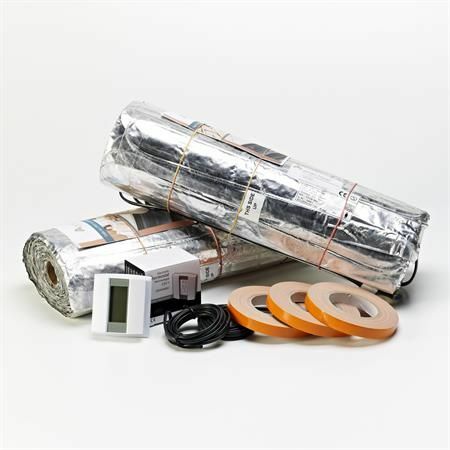 The ultimate floor heating mat, designed for quick, easy & reliable installation. 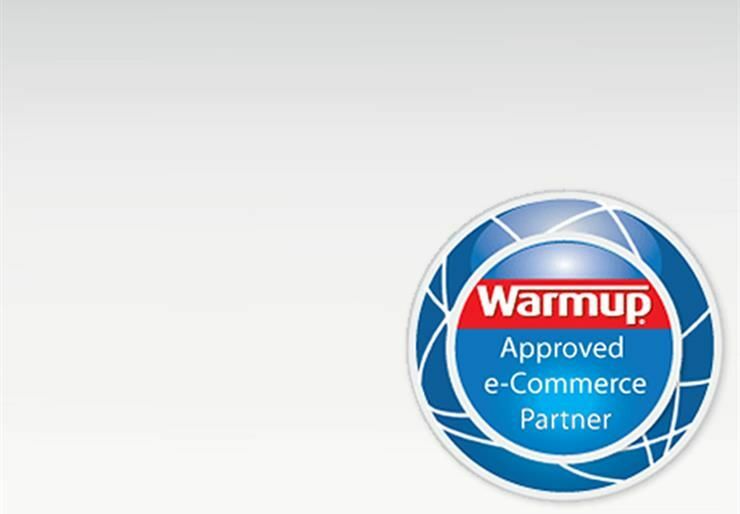 Warmup electric underfloor heating systems and thermostats at trade prices. 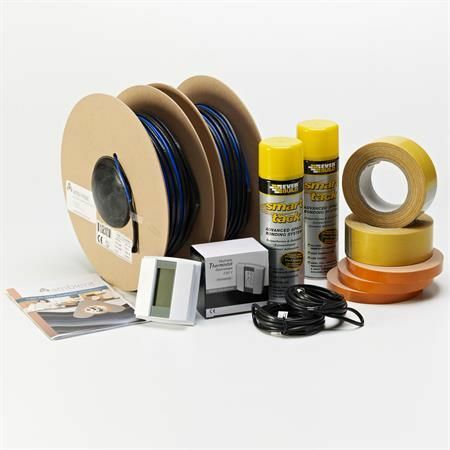 Ambient offer a select range of Adhesives & Levelling Compounds. Most of us are used to standard radiators and assume they do the job of heating spaces reasonable well, but they are in fact inefficient and wasteful and have high running costs. Not only do they use a great deal of energy to heat up once the thermostat is switched on, but they also emit heat in a small area of the room, leaving “cold-spots” and creating uneven room temperatures. Electric Underfloor Heating is usually installed on top of a concrete or timber substrate, underneath your desired floor finish. A layer of insulation should always be included to minimise downward heat loss and maximise the efficiency of your electric underfloor heating system. Ambient Electric Underfloor Heating Systems all use non-corrosive, flexible heating elements with a low profile allowing them to easily be installed directly underneath floor finishes. Electric underfloor heating systems use far fewer components and are much simpler to install than plumbed-in (hydronic) systems. If you have electric underfloor heating that is either not working or is ineffective we have listed some useful guidance. 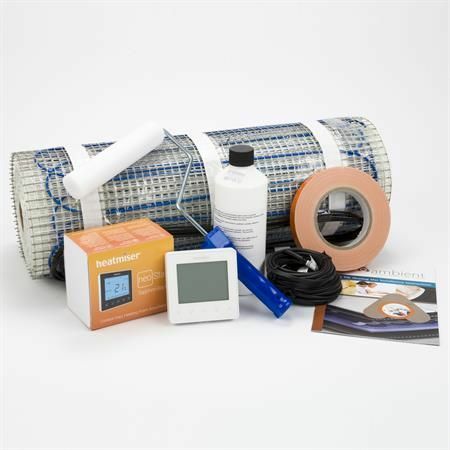 All ambient underfloor heating kits include the required accessories to successfully install your system, including a comprehensive installation guide - it is important to read the guide fully and familiarise yourself with its content prior to installation but we have also listed some Do’s and Don’ts to help you prior to or after placing your order. DO: Measure the actual heating area accurately, heating mustn’t be taken beneath fixed furniture such as Baths, Shower Trays, Toilets or Kitchen Units so deduct these areas when working out the available heated area. DO: Choose a heating system that fits within your open heating area and of a type appropriate to your chosen floor finish, typically you would choose a heating kit 10% smaller than the open floor space. DO: Use an appropriate insulation material beneath you’re heating, insulation will need to cover the full floor area being tiled or laminated over. DON'T: Guess you floor area. DON'T: Allow for heating beneath fixed furnishings. 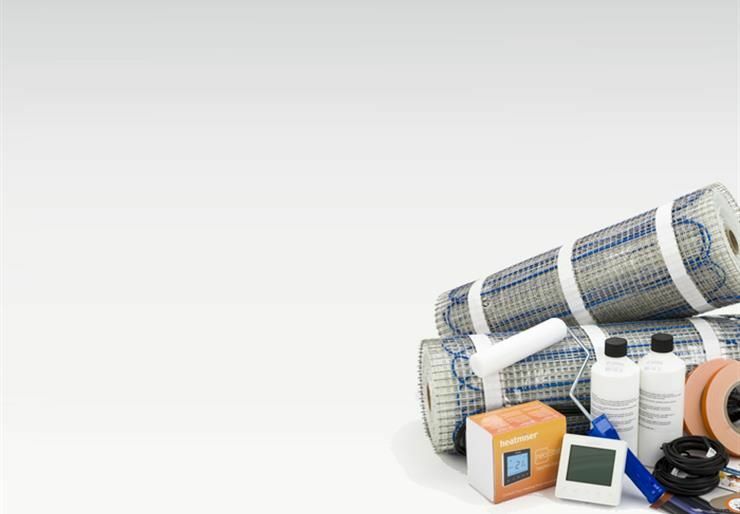 DON'T: Forget to deduct 10% from your open floor area m² when choosing the size of your heating mat kit. DO: Read all installation and instruction guides supplied prior to commencing your installation, all guides can be downloaded from this website prior to or after purchase. DO: Test all heating mats and cables prior to, during and after installation, make sure you add the final test readings to the guarantee page at the back of the installation guide. 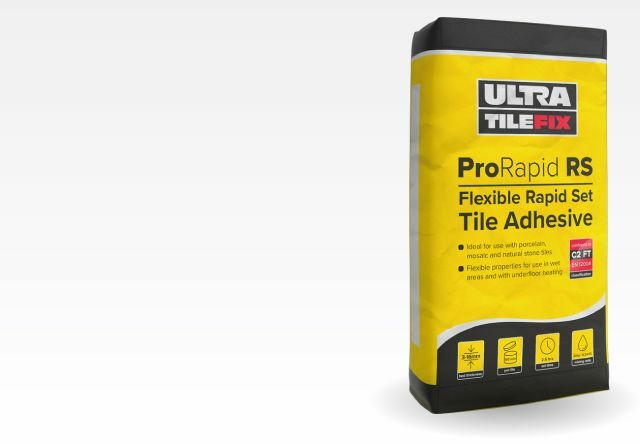 DO: Use flexible tile adhesives, levelling compounds and grouts. DO: Fully embed the heating wire and the heatshrink joint where the heating wire (blue) meets the cold tail (black). DO: Have a final measure of your heating area before unrolling your heating mat, mat’s that have been unrolled or cut can’t be exchanged or returned. DON'T: Cut or shorten the heating cable (blue), this will invalidate your guarantee, the cold tail connection (black) and the floor temperature sensors can be shortened prior to termination. DON'T: Allow heating the wires to touch or cross, equal spacing’s must be maintained across the entire heated area. In these colder months, getting out of bed in the morning to start our day just tends to take that moment longer. Giving up the warmth of bed to step out onto that cold floor isn’t the best start to your day. However, with an Electric Underfloor Heating system your mornings can be just a little more enjoyable, and a lot more comfortable. 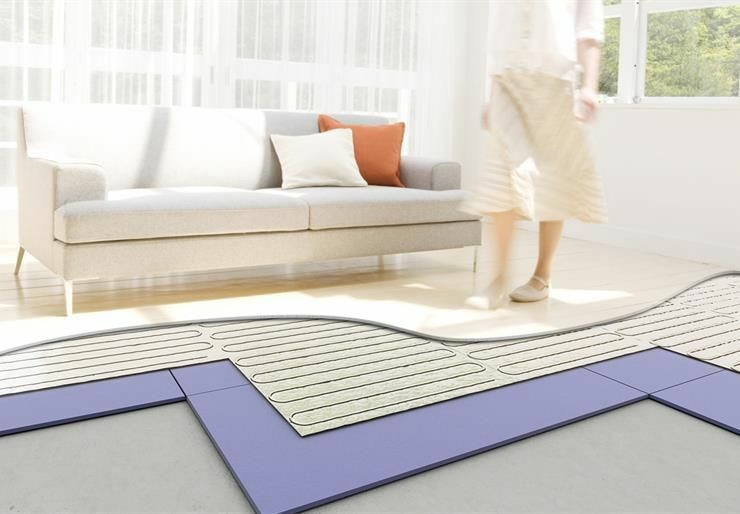 Electric Underfloor Heating systems turn your floor space into a heat emitter which warms the room from the floor up. This is quite different to other heating methods where heat is emitted typically from wall mounted units which result in top-down heating. Aside from the simple pleasure of the floor being warm underfoot with underfloor heating, it is perhaps most importantly a highly efficient method of heating your home during these colder months. It is arguably because of its efficiency, and the comfort that underfloor heating provides as a heating solution that it has become increasing popular as an addition to bathroom, kitchen and bedroom refurbishments. It is also a great choice to consider when adding rooms to your home, and would be appropriate for almost any form of home extension. There are a number of other benefits in using underfloor heating too; wall mounted heating systems can have some bearing on how you can position your furniture or style a room for aesthetic reasons, or more functional reasons like not wanting to block heat vents. Using an underfloor heating system removes this concern by effectively turning your entire floor space into your source of warmth leaving you free to furnish a room without restriction. There is also a further design benefit to underfloor heating that you can’t see. Specifically, you don’t see it! While there are certainly options in wall mounted heating that can be quite attractive, they tend to bring their own look to a space that might not be to everyone’s tastes. Installing quality underfloor heating can also add value to your home and can increase the selling appeal to potential buyers. When considering home resale value, or simply the freedom to furnish and decorate as you like, underfloor heating is very hard to beat. While there are a number of different options in underfloor heating that a specialist provider can explain and recommend to fit your needs, electric systems generally are the easiest to add to existing buildings. 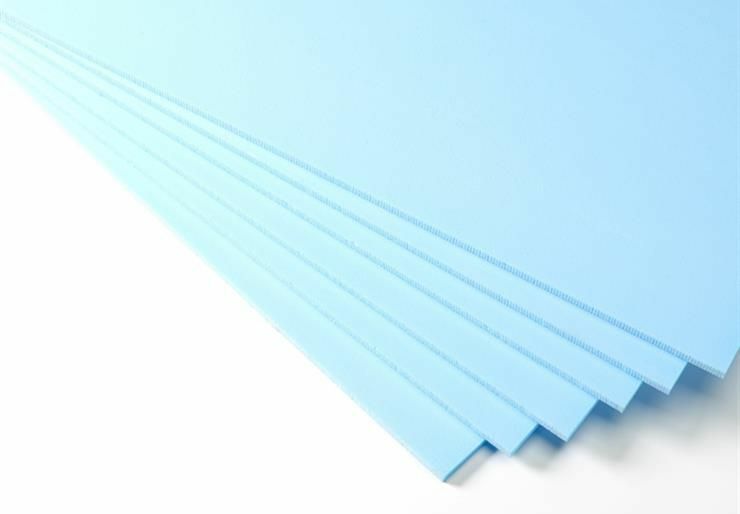 They are very thin and can be quickly and easily installed underneath virtually any type of floor covering. Their ease of installation means they are also the simplest to add to your home even without larger scale renovations. Plumbed-in, or hot water based underfloor heating systems are far more invasive to install due to the extensive network of pipes and tubes involved, and the installation cost is typically much higher than on an electric underfloor heating system. 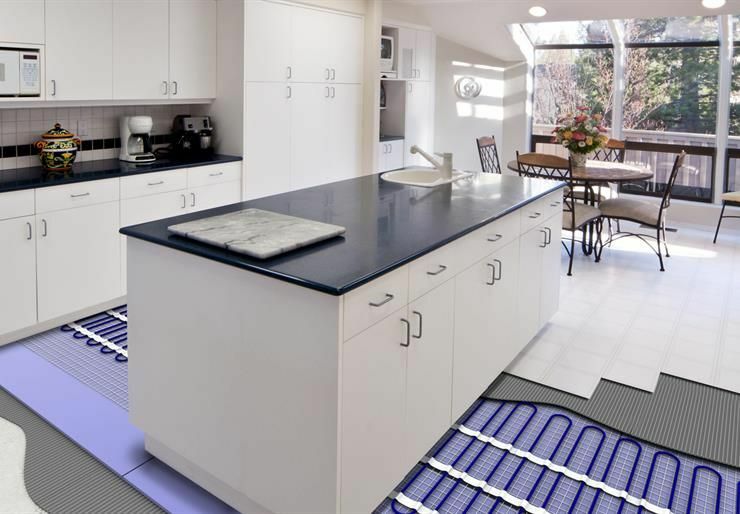 If you’re planning on refurbishing your home, or, just tired of the first part of your day being rolling out of bed and stepping onto a cold floor, an electric underfloor heating system could be one of the best home improvement investments you ever make. Electric underfloor heating insulation isn’t expensive, but will significantly increase the value delivered by your floor heating system. You want the best from your underfloor heating system, that’s a given. You want it to heat your home as efficiently and quickly as possible, and you want it to do its job of keeping you and your family supremely warm and comfortable. So let’s take a look at how underfloor heating insulation is an integral part of any well designed underfloor heating system that will help you get the very best results. To really understand the benefit of underfloor heating insulation, consider how heat itself works. Any form of heat from heating systems, the sun, or a simple campfire, will all naturally radiate heat out in every direction; that is the nature of heat. However, that isn’t ideally what we want from our electric underfloor heating system to achieve optimum results. There we don’t want to use the heat energy to warm the cool, damp earth beneath our home; we want to significantly reduce the heat energy spent in that direction and focus that energy upward and outward into your living area. This is exactly what underfloor heating insulation achieves. The main effect of focusing this heat into your living space with insulation is that your home will be warmer due to the substantial reduction in heat energy loss. It also means your underfloor heating system will effectively heat your floors and entire room much faster, which is important not only for your increased comfort, but also gives you more flexibility for occasional use and fine tuning heating as the outside temperature changes. It makes an already efficient home heating method even more efficient, and saves you money in energy costs. 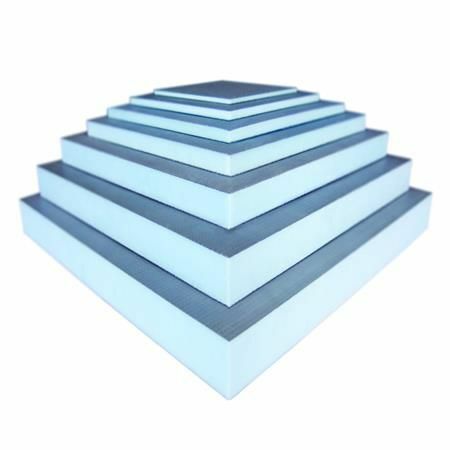 There are a number of different underfloor insulation types to suit different floors, just as there are different types of electric underfloor heating systems. We can recommend the best combination of both and provide guidance on home heating designs that will maximise effectiveness, minimise energy costs, and contribute greatly to the comfort of your home. The idea of under floor heating dates back thousands of years to Roman times, when homes and bathhouses were warmed by a system of furnace flues under floors before passing through chimney-like structures on the roofs. Floor heating technology has come a long way since then, and while modern systems bare very little resemblance to their ancient origins, the concept has stood the test of time because it is effective, efficient, and simply creates a more habitable, comfortable space for you to enjoy. One of the many benefits of under floor heating is that it allows you to turn your entire floor space into a radiant source of warmth. Other heating solutions tend to have a specific heat source location, meaning a room will be warmer closer to the source, and cooler further away, whereas with under floor heating an entire room can be evenly heated throughout. This gives you the freedom to move around your home without feeling cooler or warmer, and the evenly distributed heat can be set to your preferred temperature using a simple under floor heating thermostat. This unparalleled even heat distribution is one of many reasons the concept has remained and evolved for thousands of years. Under floor heating is also an exceptionally efficient heating solution, making it both a great heating option practically and for your bank account. It can save a lot in heating costs, with energy usage being substantially lower than other home heating solutions. Underfloor heating requires a much lower energy flow than positioned heat source solutions like radiators, heater appliances, or ducted air that rely on pushing heat out from a small source. Under floor heating is also a great option for those sensitive to dust or allergens that fan forced heat systems can introduce and move around your home. When added to the design aesthetics of an invisible heating solution, and outstanding efficiency in keeping you and your family comfortable and warm, more and more people are adopting this modern solution with ancient origins. The UK government set out targets in its National Action Plan For Renewable Energy (2009) for the country to produce 30% of all electricity and 12% of heating energy via renewable sources by the year 2020. As a country we are on track to reach the 30% target for electricity, but progress on heat from renewable sources is currently stalled at 4.8%, and will certainly fall short of the 12% mandate. Because of the efficiencies we are achieving as a country on renewable power generation, but the difficulties in transitioning towards the use of renewable sources for heating, it makes sense to consider using highly efficient electric heating sources in our homes. The fact is that over 70 per cent of the UK's heat generation is used for domestic purposes. Unfortunately, a high percentage of UK houses are poorly insulated, and actually rank amongst some of the worst in Europe for energy consumption vs heat retention. One strategy that would help UK homes heating become more energy efficient would be to invest in better insulation for attics and roofs and use more energy efficient windows and doors. It also makes sense to invest in an energy efficient electric underfloor heating system as an alternative or secondary heat source. For homeowners, replacing a natural gas or hot-water based heating system potentially represents an enormous cost. However, taking measures to improve the energy efficiency of a property through loft insulation or triple glazing could quickly increase renewables' contribution to heat generation by reducing total demand. Adding complimentary heating options like underfloor heating based on the greener electricity we now seem on track to produce in the UK can also make a big difference. An electric underfloor heating system targets warmth into areas where it is needed, and should always be insulated underneath the heating element to direct the heating energy upwards into the room instead of dispersing in all directions (including into the ground!). Install underfloor heating mats or cable systems that match your heating requirements, and with proper usage your home will be greener... And of course warmer too! Can electric underfloor heating be repaired ? 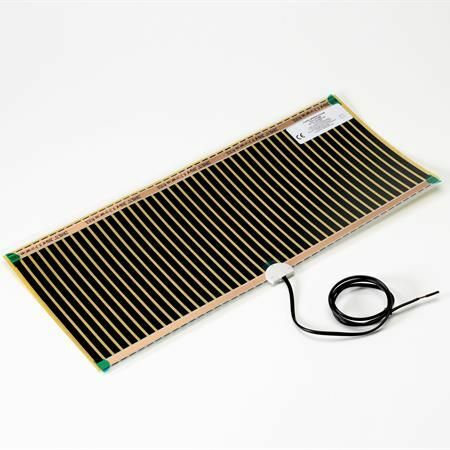 Can I buy Ambient Heating systems on E-Bay? Do Ambient sell through shops? 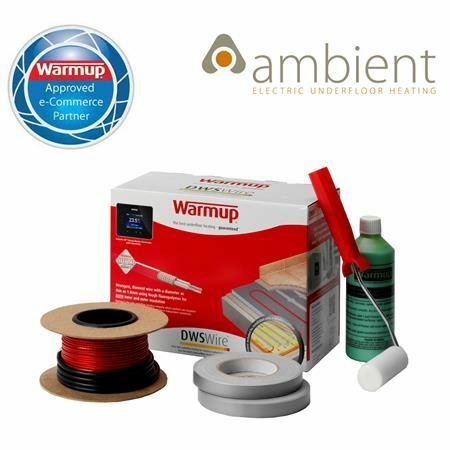 Are Ambient underfloor heating kits guaranteed? 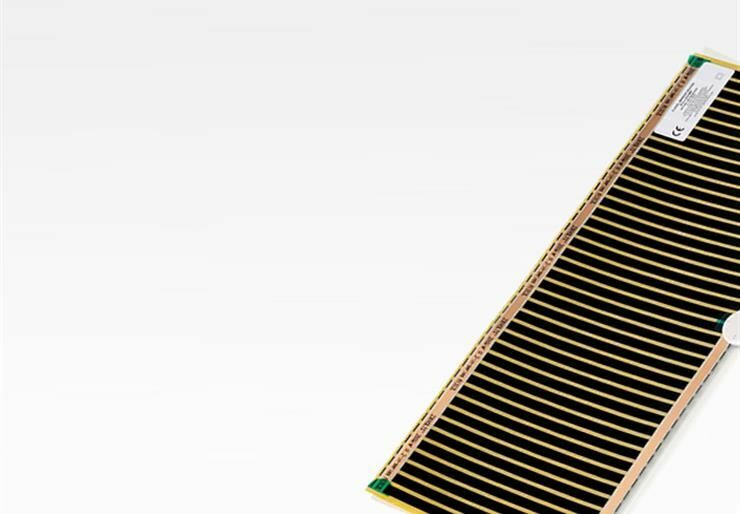 Do Ambient floor heating mats comply with current regulations? How much does electric underfloor heating cost to run? What are the installation basics for electric underfloor heating? All well received, thanks for your advice, prompt service and kind discount, very impressive service. May I just say you guys have excellent customer service... The reason I came back to you and keep recommending you. Just a short note to thank you for the sound advice that you gave me when ordering and installing the Ambient underfloor heating system. The overall cost of Ambient was substantially lower than rival products, the delivery speedy, the materials supplied were of exemplary quality, and the installation was really simple. I would recommend your company over all others that I requested quotes from, and I wish you every success in the future.